Dedicated to leading edge Supply Chain Technology since 2001, Logistics Software International combines functionally-rich software with our team of highly skilled IT and logistics professionals to deliver automated and transparent supply chain solutions. 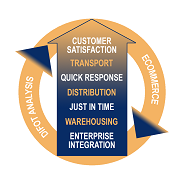 Working in conjunction with many ERP systems including from companies such as Microsoft, SAP, Infor and Oracle, LSI delivers modular solutions which totally automate inbound product, warehouse management, distribution, eCommerce, freight management, carrier management, , freight tracking including proof of delivery capture; ensuring complete end-to-end visibility and accuracy. LSI solutions are fully accredited for EDI trading by all the major Australian retailers. Click here for listing of accredited EDI retailers. iSupply freight solutions can be setup to generate carrier specific freight documentation. Cick here for a listing of carriers used by LSI clients. iSupply FMS is a multi sender, multi warehouse, multi despatch point, integrated freight management system that prepares barcoded freight labels, barcoded consignment notes and electronic manifests; analyses despatch and freight management operations, as well as consolidating freight on a warehouse basis. iSupply DMS is a distribution management system which combines barcode scanning with our state-of-the-art freight management technology to deliver a highly automated and accurate distribution process. iSupply’s stock management module provides the means to store and manage inventory items by location. By providing full control of stock items in multiple locations, iSupply helps reduce picking time, better manage overflow stock, increase flexibility of warehouse layout. iSupply is a state-of-the-art multi-client, multi-warehouse warehouse management system powered by .net/SQL technology, with its own integrated Business Intelligence module. iSupply's Business Intelligence module transforms your raw supply chain data into valuable business insight. Using familiar tools such as Microsoft Excel, users are able to generate their own ad-hoc analysis, combining any number of business measures and Key Performance Indicator. The Tempo Platform has been design for first concepts to deliver visibility across a transport and logistics network. From job dispatch and freight allocation to all the standard and not standard process a driver may need to carry out in the field. RFI has chosen to replace their third party managed freight management software with iSupply FMS.